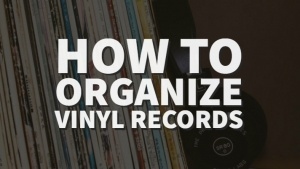 Do you have a ton of vinyl records laying around your home collecting dust? 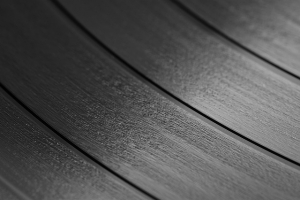 Without a record player, the records are essentially useless, or are they? Did you know that you can cut a vinyl record into different shapes to create crafts? 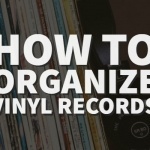 You can use your old records to make magazine racks, vinyl record clocks, wall hangings, and so much more. Repurposing these classic items gives old albums a longer life after you have no use for them when it comes to listening to the music that is on them. 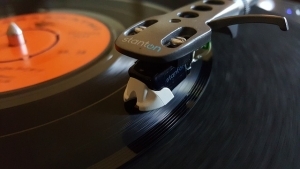 Cutting vinyl records can be as simple as cutting a piece of paper, but it takes some practice and safety precautions to do so. 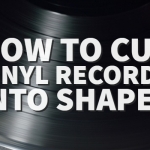 Below is a simple explanation on how to cut vinyl records into shapes. The first thing you’re going to want to do is to make a template for the image that you want to cut out of the record. You can do this by drawing a silhouette on paper. You can do this either by hand or use a drawing software. If you’re crafty, you can use the photo editing program that will put the create an image outline that can be transferred to the record. It’s important to remember that you are removing the negative space when you create the image. If you are cutting heart-shaped earrings, you will need to trace the heart onto paper. Once you have printed or traced the template on paper, you need to cut it out and tape it to the vinyl record. Make sure there is enough room to trace the image edges. 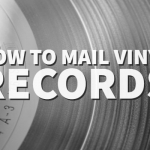 Use a pencil to outline the template onto the record. If you make an extra mark, you can wipe the graphite away later. Once done, remove the template. You’re going to need an oven for this step. You must preheat your oven to 200 degrees Fahrenheit. Once that’s done, place the vinyl on a cookie sheet and put it in the oven for two to three minutes. Remove the vinyl using oven mitts and make sure it’s malleable. Once it’s removed, you have about thirty seconds to one minute to work on the record before you need to heat it up again. With that said, make sure you have a workspace, such as a cutting board, ready nearby. 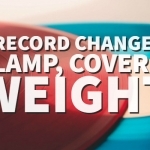 Alternatively, you can use a tool for wood-burning or a heat knife to cut your record. 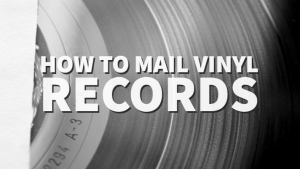 If you use this method, you can place the record on top of a surface that’s resistant to heat and make sure to alternate cutting for ten seconds at a time, allowing it to cool to keep it from warping. Make sure you wear safety gloves because some of these tools can reach temperatures of 1,000 degrees Fahrenheit. You can cut the record using metal snips or a utility knife. Cut along the lines that you have drawn to create the shape. You may need to reheat it and score it several times, depending on the thickness. After you have made all of your cuts, it’s important that you sand any rough edges or trim the lines if needed. You can then wipe off any extra graphite marks you may have left when tracing. Batman Clock: After creating your template and cutting out the Batman shape, you are going to want to widen the hole in the middle of your record with the drill until it matches the size of the clock mechanism. You can then put the mechanism through the hole and match the hands up with whatever design you chose to use in the middle for the numbers. Coasters: After you have heated up your record in the oven, cut around the label of the record with snips. If the center got warped somehow, place it back in the oven and straighten it between two heavy, flat items. Sand the rough edges and cut some felt to match the size of the coaster. Glue the felt and voila! iPod Cover: If you’re super crafty, you can take an old record and make it into a skin for your iPod. It just so happens that the center of a 45-rpm record is the same diameter as the click wheel on the iPod. You can use a template for the outer front of the iPod to cut out and then clue some felt onto the back of it to protect the iPod from scratches. Jewelry: You can make so much jewelry out of just one vinyl record. It’s as simple as cutting out your shape, maybe manipulating the curvature of it, drilling a hole for the ear wire, and assembling them. You can also make bangles! Silhouettes: These are super cool! You can use recycled vinyl to cut into shapes of people to make outlines. Make just one person or a whole family out of one record. There are so many crafts that you can create with recycled vinyl records. If you want to get detailed with your work, consider using a rotary tool or a laser cutter to make the tiny items with a lot of detail to them. There are also crafts that you can do without cutting the record if it’s a task you don’t think that you can do. But honestly, all it takes is an oven, some snips, and a lot of creativity.